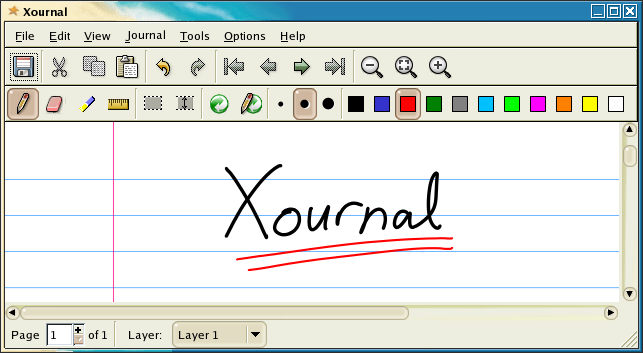 Xournal is also written in Java, and thus also installable on Linux, Windows and Mac. Both software projects are open source, and have similar features. Why choose one over the other? If subsequent editing of sketches is important, the native file format for Jarnal is SVG. Scalable Vector Graphics is an open web standard that continues to rise in popularity, and SVG is editable with the open source Inkscape product. Xournal .xoj files are gzip-compressed XML files, and the work on export to SVG seems to have not progressed since 2010. Xournal is ready-to-install on Linux through the Ubuntu Software Center, while Jarnal requires a little more expertise to configure. The Xournal interface is more refined, with the more current release in 2012. There are updates on the Jarnal wiki, but the release schedule is not as clear. In the world of free software, it’s nice to have options. « Older « Why do power failures seem rare in our Toronto neighbourhood?